Bill the trucker decided he trusted the bridge, and again we had a first slow crossing with my eyes glued to the Bridge-O-Meter. He said his truck weighed about 77,000 lbs with a full load of gravel, as he had here. About 2/3 of his truck weight is on the back axles, and here they are mid-span. Again, the Bridge-O-Meter showed only a deflection of tiny 1/8". And because the tires did a smoother job of crossing than the steel tracks of the excavator, there was no bounce at all. Dumping made no difference in deflection either..
Dave and I were super happy with the bridge's performance at this point. A calculated point load at center of 88,000 lbs would theoretically give a 1/2" deflection for those beams alone, and represent 66% of yield strength. 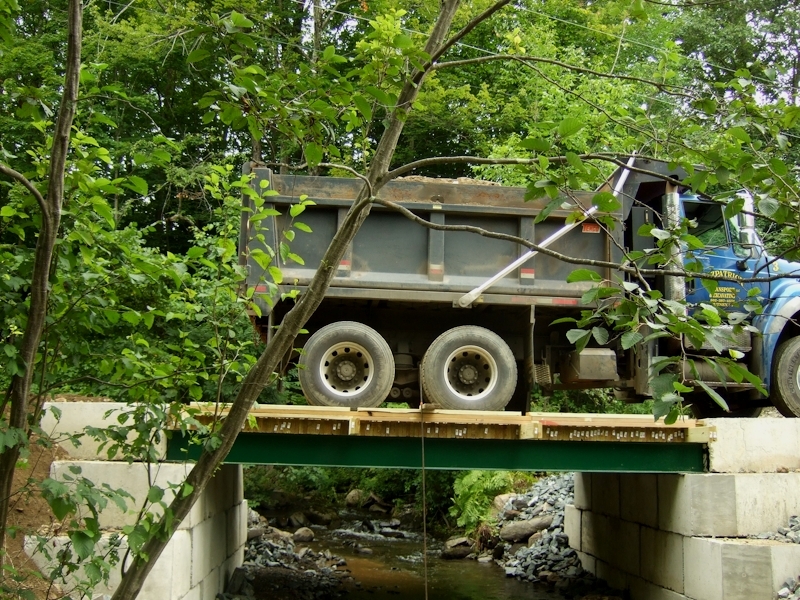 We didn't even come close to that deflection with a real life 77,000 lb load, and proved that for any use I'm likely to need, the bridge will handle it. The only conventional vehicle likely to exceed what we've already tried would be a fully loaded concrete mixer with three back axles. I think they're around 80,000 lbs Of course that would be a more spread out three axle load as well, and not a point load. So fairly likely to be another small fraction of max permissible deflection. I have no plans to ever pour concrete again however! Two weeks of that was enough! One question though; Will you also build retaining walls to protect the backfill for the abutments? I can imagine a good spring flow wanting to eat into the backfill if it gets the chance. Perhaps a good use for the discarded blocks? There will be more rip-rap added, but the main part of the backfill will be planted to control erosion. Maximum "Base Flood Elevation" (meaning predicted height for a "100 year flood") is 4" below the second layer of block in the above photo. Not very high if you imagine it -- and the amount of water you see flowing now is unusually high for August -- it's raining again today -- almost a solid month of it. So a long berm (with logs buried lengthwise in it) on the right (upstream) far side (not very visible in the second photo above) should easily shunt over-the-bank water above stream of the bridge back into the channel before the rip-rap even starts. The near bank on the right, upstream of the bridge is solid, near vertical ledge. It can't erode. The state Agency of Natural Resources and the local Floodplain Administrator approved the plans, and they did require a hydrologic survey and report, which was performed beforehand. This has been a long term planned project with all the I's dotted and T's crossed. We've had 3 visits from the state during construction, and the final approval will happen when we're done -- possibly as early as next Monday. ps. oh, re. the older block -- Dave will use that for some other landscaping project -- they will be removed when he's finished here. They're fine for landscape retaining walls, and can do nice attractive curved embankments. He doesn't feel it will be hard to use for someone else. 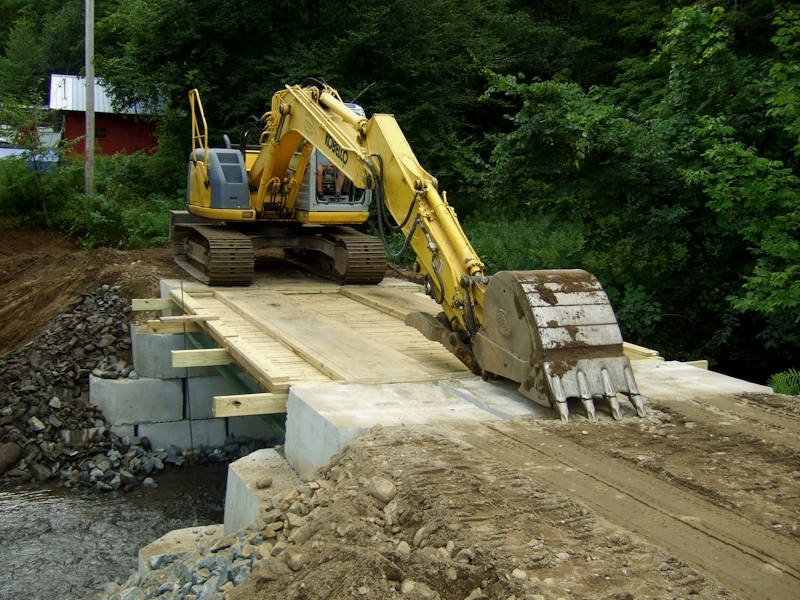 They're just not right for bridge abutments with steel beams crossing them. Thanks for the answer Steve, I guessed you had it under control. It was just me thinking of spring flooding here in Sweden, which can be very violent at times and require quite a lot of preparation for structures like bridges. Can't wait for the rest, its ever so interesting. Hi Peter, no problem, we've had as much water last month and this one so far to equal spring ice-out flooding. No problems so far at all. re. progress, we're in road topping and cleanup mode, so there's nothing much interesting to see, yet. 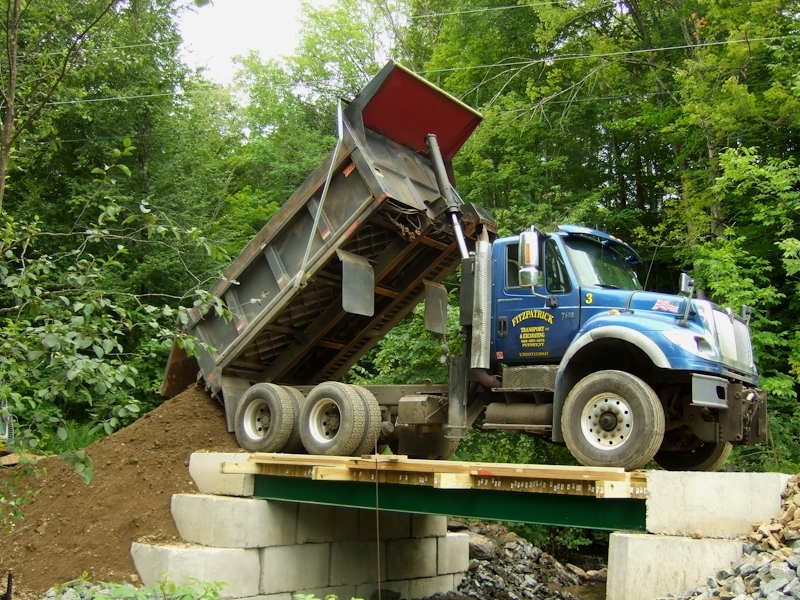 Yesterday Bill the trucker brought in 11 loads across the bridge.-- 154 cubic yards, and this morning, two loads of crushed rock topping. Just before supper I got an okay from Dave to begin building the railing, meaning excavator and trucking work are finished. I drove across the bridge myself yesterday, and my wife did this afternoon with groceries....a new convenience! Tomorrow I hope to have the railings done, Dave will bring his tractor and York rake to crown and smooth the drive. 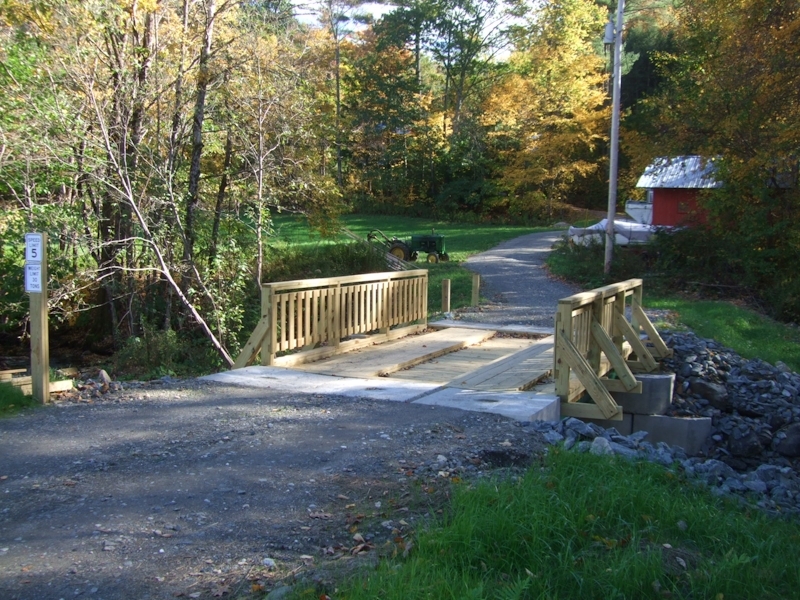 Sam will show up to spread hay and grass seed on the areas beside the bridge and drive. By tomorrow evening we may be finished with this project! A belated last photo of the bridge with the railings up in the low October sunlight. Surprising how much work goes into ground and how little is finally visible from all that earth moving and sabilizing. Now when I see a "little bridge" I will give it a nod. I'm just wondering why there are three lower levels in the bridge surface. Does this serve any useful purpose. A great project and I followed it with interest. Reallyb nice job and well done. Also interesting to see the speed limit sign before the bridge. Is that sign mandatory from a regulations point of view or just a precation by you? Nice job Steve, I love the speed warning sign! Does the central section allow some "spring" to the deck when the running sections are loaded or does it aid drainage (or both!) . Nathan. There are two wear strips which I guess technically divides the bridge deck itself into three sections. The wear strips do what they say in their name, but also, being 3" deep, spread out the loads further across the main deck planking, which runs cross-wise. 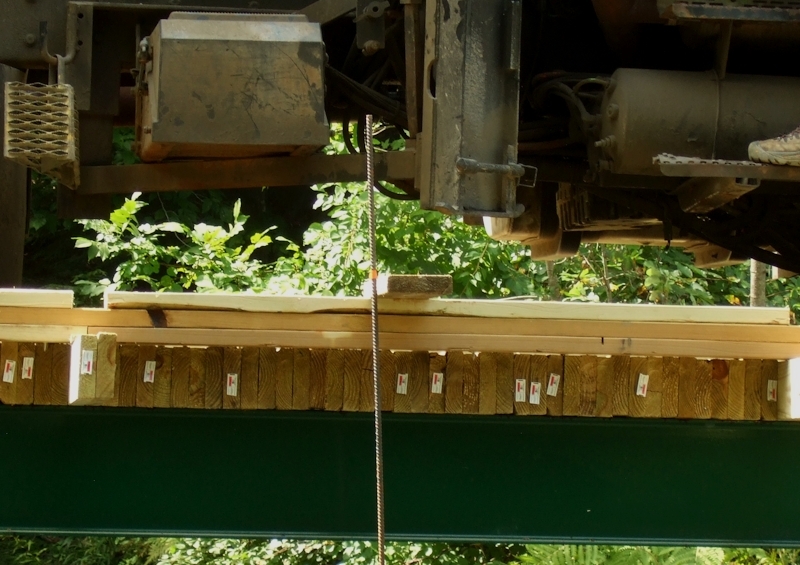 And of course they in turn spread the loads across the four steel deck beams and add additional stiffness. As mentioned the deck is made up of 2x6's on edge. The wear strips add 3". Drainage has not been a problem -- the corners and ends drain. There hasn't been any standing water despite all the rain we've had -- seems to rain every other day. The wear strips are at the level of the tops of the concrete abutments, so tires neither drop onto the bridge, nor bump up onto it at vehicle entry and exit. I figured, it's best not to have every 20,000 lb axle load acting like a hammer twice per crossing. Driving across it feels very smooth. There is no bump. The strips are quite wide so compact cars and wide axle trucks alike will stay on the treads, rather than fall off the side onto the bridge deck. Not that it would hurt anything to do that, but it might make for a disconcerting moment for a small car. I've crossed the strips on purpose while maneuvering my tractor into position for auguring holes for posts at the ends, but I hardly noticed it. There are no regulations about road signage on private property, but I do want people to slow to 5 mph when crossing. Especially my in-laws! I'm sure it can handle much higher speeds, but why subject it to that? Besides in winter, I don't want anybody slipping into the rails, etc. 5 mph is an intelligent speed then. I've also posted it at 30 tons, since I had a few delivery trucks balk at crossing un-posted and their drivers walk packages up to the house. Thought I'd save them some time and trouble! They were used to no bridge here. Nathan, there just isn't any perceptible spring when big loads cross. 35 tons of loaded dump truck was only 1/8" over 16' And rainwater just drains naturally off the ends. We did a good job of leveling the deck apparently, and last I checked nothing had changed with use. Almost a quarter million pounds of concrete, plus a few truck loads of 6" crushed rip-rap stone is keeping it pretty stable. I always thought that it could help in handling frost as being colder it would roll off to the lower area. The Incans had agriculture set up like that crops raised to protect against frost! Tom, could be. Coincidentally we had our first frost this morning. I didn't notice it on the bridge though, when I walked my daughter to the road for school bus pickup. The bridge does get sun during the day in winter. When snow gets here, the wear strips will definitely dry first after shoveling. I'm planning to set up a sand barrel nearby. 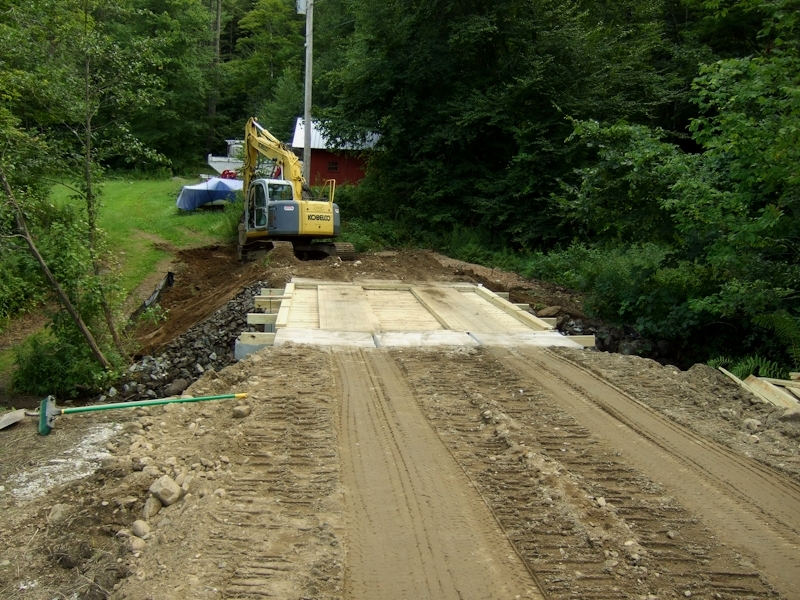 Another advantage of having a bridge and driveway is bringing in sand. After every icing I used to hand carry it in and spread it along all 600 feet to the house. Even then, we routinely wore ice grippers in the walk to the cars, and back, carrying groceries and heating fuel.